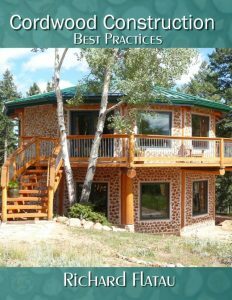 Alan Adolphsen built this absolutely beautiful small cordwood home in Hope, Maine in 2004. 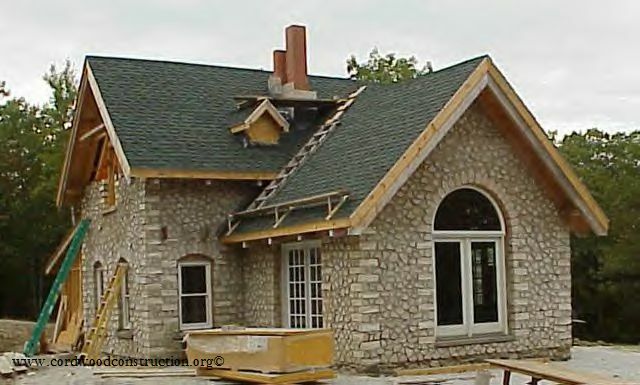 He describes his building adventure as an owner-builder. 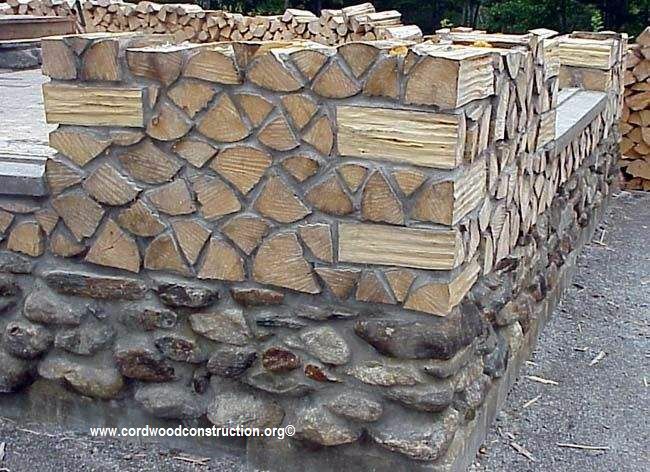 One with pluck and a good knowledge of construction. 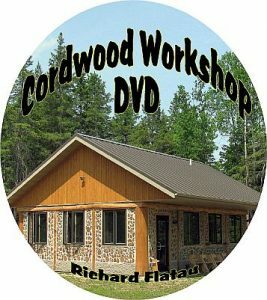 Here are a few words from Alan on how he decided upon cordwood and then tackled his project with gusto. 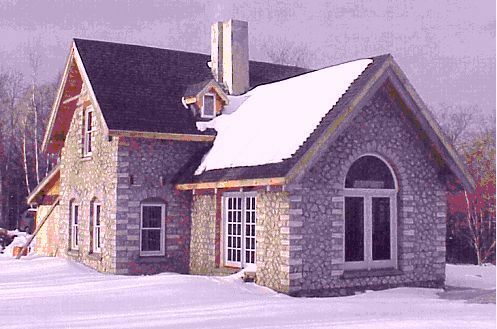 Alan’s home under a soft blanket of snow. 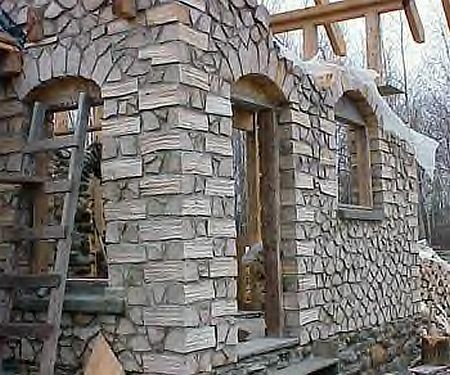 A corner section of wall with triangular split aspen pieces, which allowed for very precise mortar joints. 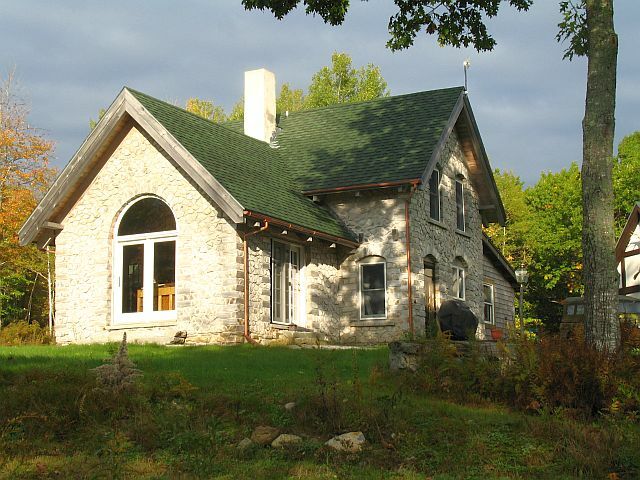 The interior is comprised of beautiful arches and excellent wood and stone work. 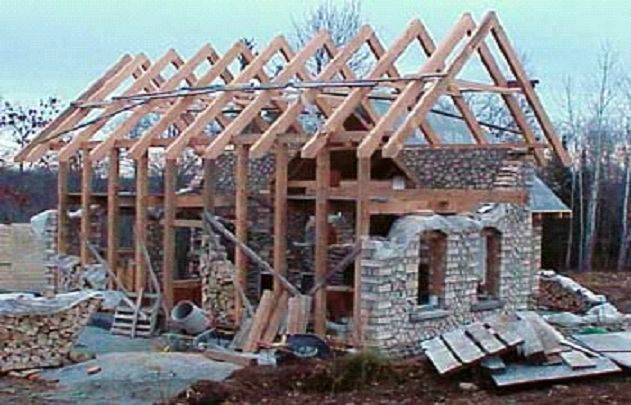 “I started looking for alternative methods for building. I have done a lot of modern conventional construction and I just could not bring myself to use these flimsy methods that would allow someone to virtually kick a hole through my house. 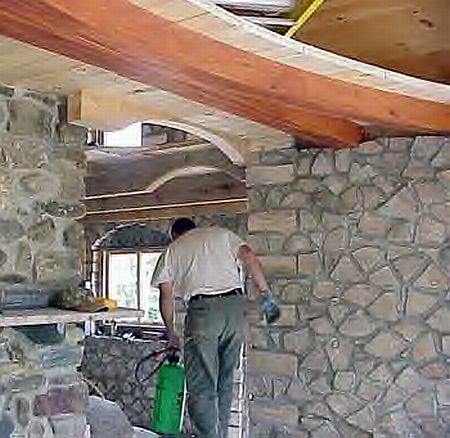 With the walls under construction, a bleach water solution is applied to reduce the possibility of the log ends darkening. 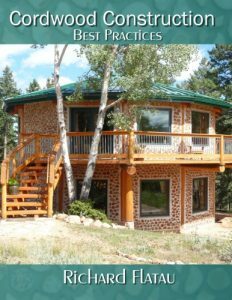 “After about 500 sketches of the ultimate house, I finally decided to look at what I really needed to accomplish. Living in Maine, I wanted first to heat as cheaply as possible, so big was out of the question. If the place was going to be small, by golly, it is going to be “cool.” This led to another 500 designs lying on the floor. “Castles have lots of arches, which frame the view and lend their shape to the observer’s peace of mind. So I decided that major design elements, like windows and doors, had to have arches over them. 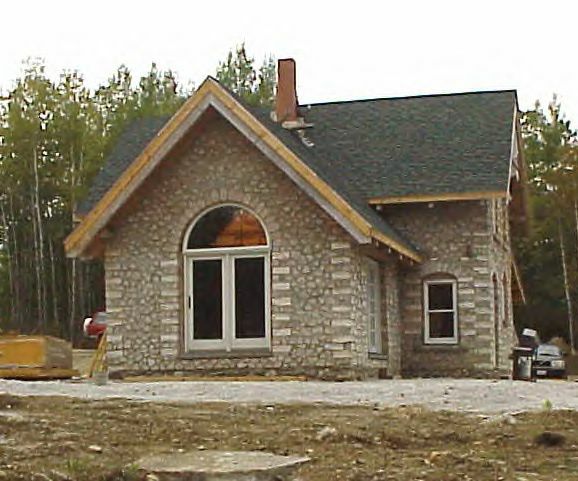 Arches, combined with squares and 45-degree angles, are what “makes” this little house visually. And arches have very real structural benefits, too. 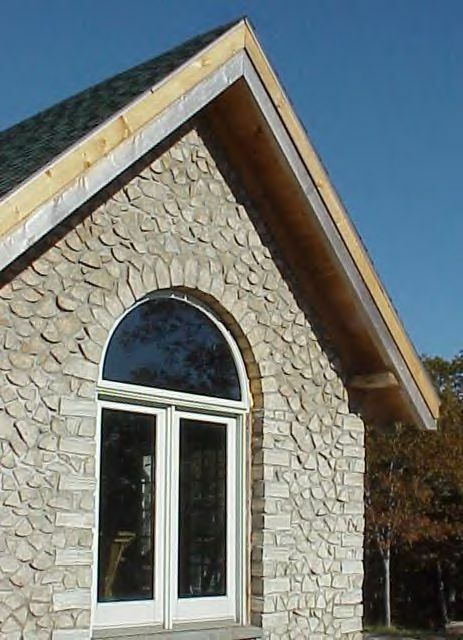 I looked for products that would let me build masonry arches. I thought of pouring them in concrete. I thought of lifting them, but then quickly decided on fitted wood. 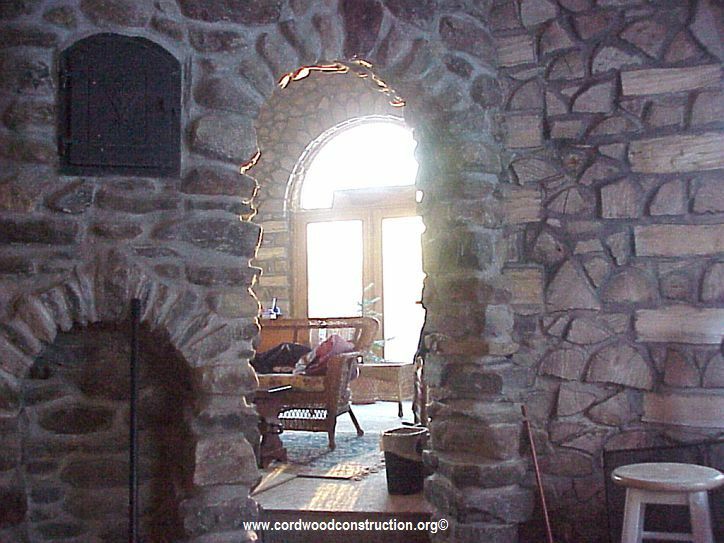 The interior with its masonry stove and arches is quite a thing of beauty. 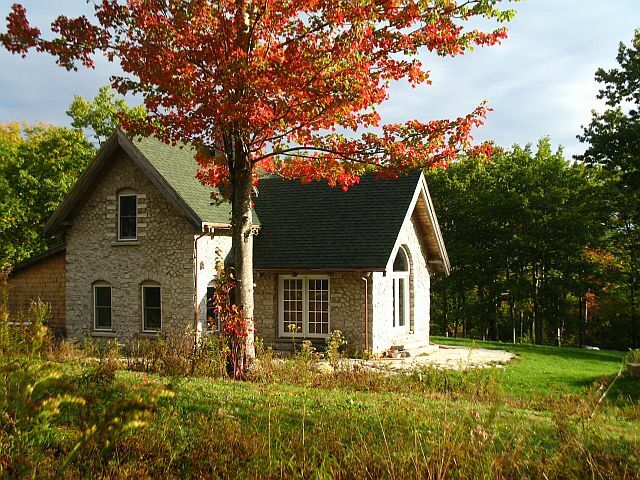 The house is now all finished, comfortable and gorgeous. For information on building with cordwood construction you might wish to visit www.cordwoodconstruction.org and if you have a notion go to the menu on top and click on News, Articles, Photos and Books for a visual feast. The backyard BBQ is all set for grillin’.